Have you found an online vendor selling Bacardi Spice? Ordered spiced rum in a bar years ago and was served this. Remember enjoying it but never tried it again since. Shane it's been discontinued as I would've liked to try it now I've tried more styles to compare. Brown, spice-flavored rum distilled from fermented molasses. Blend of golden rums. This spiced rum mixes well with ginger ale. The spice flavors of cinnamon, nutmeg and a little ginger give this rum an interesting taste and wide appeal. 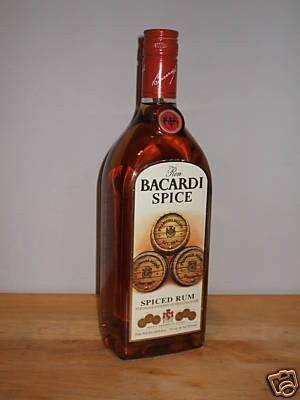 Bacardi Spice was discontinued in 2005 and is no longer available. Distilled by Bacardi - Puerto Rico.